Saturday, April 6, 10:00 am to noon, Lambert's Cove Rd, WT. 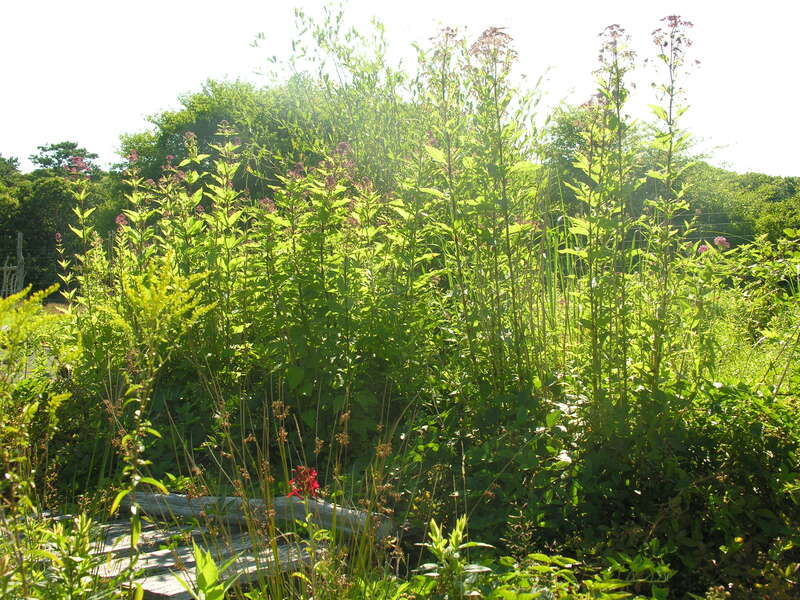 The Nature Conservancy seeks 5-10 volunteers to help remove last year’s old stems and debris from perennial plant beds in their Native Plant Nursery. The work is not strenuous, but requires repeated kneeling and standing. There will also be work planting trays with native seed that will be grown for TNC’s Vineyard Habitat Network. Snacks and beverages will be provided. Please RSVP to Liz Loucks via email or call 508 693-6287 ext. 15. Saturday, April 6, 9:00 am to 2:00 pm, M.V. Community Services (across from the High School). Bring your old and tired computers, monitors, televisions, printers, notebooks, copiers, scanners, air conditioners, stereo equipment, dehumidifiers, cell phones, microwaves, fax machines, all refrigerators, washers, dryers and ranges. Fees range between $1 and $30. No charge for mice and keyboards. For more info, call 508 693-7900 ext. 229. Saturday, April 6, 12:30 - 2:30 pm, at the Oak Bluffs Public Library. Drop off your gently used books (all ages, all categories) at the second annual book drive sponsored by the Library Friends of Oak Bluffs. Also looking for DVDs, CDs and Audio Books on CD, as well as recent textbooks (last 3 years only). For more info, call the library at 508 693-9433. Sunday, April 7, 1:00 to 3:00 pm, Aquinnah. Land Bank staff lead a guided walk at Toad Rock Preserve in Aquinnah. Rain or shine, dress for the weather and wear sturdy shoes or boots. For directions and more information call 508 627-7141; see website for property description. Tuesday, April 9, 10:00 to 11:00 am, Edgartown. Join Felix Neck staff for a guided walk on the Sanctuary to witness all of spring's offerings. $5, free for Mass Audubon members. See website of call 508 627-4850 for details. Saturdays (April 6 and 13), 9:30 to 11:00 am, at the FARM Institute, Katama. Sunday, April 7, 1:00 - 3:30 pm, Aquinnah. Games, story time and nature activities for the whole family at Sassafras Earth Education in Aquinnah. $25. For more information on this and other programs, see website or call 508 645-2008. Continuing last week’s theme of holiday leftovers, here’s a flavorful way to refresh a leftover lamb roast. This stir-fry method will of course work with other leftover meats, or sliced chicken breast. These proportions are for about a pound of meat. Mix all ingredients together well, or use a food processor if available (which can also help with shredding the cucumber). In its familiar facilitation role, VCS joined with partners to try its best. The idea of finding one or more donors willing to extend a long-term loan to the Land Bank was favorably received, and revived hope for a Land Bank role. There were a few false starts, but after the critical intercession on the part of one Flat Point neighbor, VCS board member Sam Look, to another, Stephen Rattner, prospects brightened. Steve then initiated what proved to be fruitful discussions with the Land Bank. The Land Bank now has 90 days to complete the transaction, but as of now the result looks tremendously hopeful! Thanks to the Land Bank and to the many partners who helped make this happen. 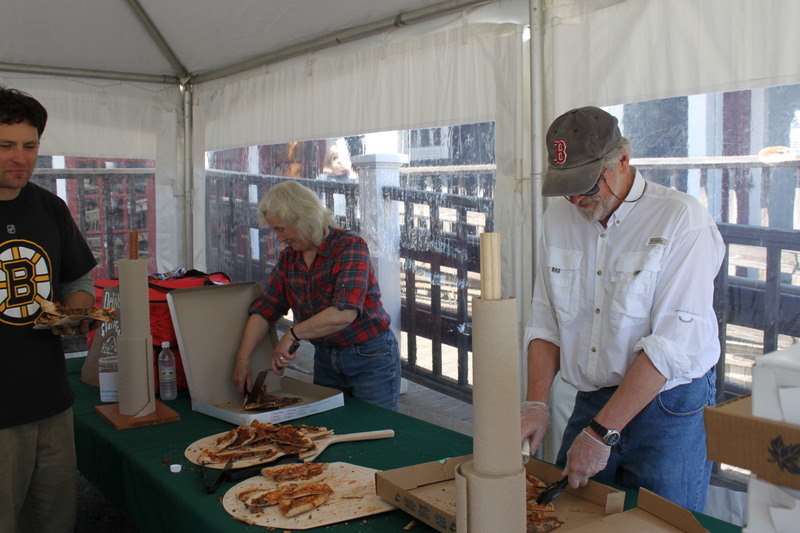 Penny Uhlendorf and Dave Nash serve up pizza from MV Flatbread Co. at last year's after-party. For more photos, click over to the VCS website. Earth Day is every day, and where better to celebrate it than on a Vineyard beach? The 21st Annual Vineyard Conservation Society Earth Day Beach Clean-up will take place on Saturday, April 20th, from 10 am to noon. Please join us at your favorite Vineyard beach for a morning of fun and environmental service. This year the after-party will be graciously hosted by the Harbor View Hotel, where you can enjoy delicious food and compare treasure hunting stories with other beach cleaners. While supplies last, kids will receive a free special edition T-shirt by ShirtsbyTed, created using custom artwork drawn by Jules Feiffer. Participants will also be entered in a raffle to take home Oceans, a beautiful book/DVD/Blu-ray set by Jacques Perrin. For over twenty years VCS has sponsored this initiative to increase local support for Earth Day and, more broadly, to encourage a greater appreciation and respect for the natural beauty of our Island year-round. Together, we can take responsibility for our Island’s beaches, one of our most precious resources. In the spring of 2005, acclaimed environmental photographer James Balog headed to the Arctic on a tricky assignment for National Geographic: to capture images to help tell the story of the Earth’s changing climate. . . . Chasing Ice is the story of one man’s mission to change the tide of history by gathering undeniable evidence of our changing planet. . . . With a band of young adventurers in tow, Balog began deploying revolutionary time-lapse cameras across the brutal Arctic to capture a multi-year record of the world’s changing glaciers. The screening will be at the M.V. Film Society’s new Film Center, located at Tisbury Marketplace. Stick around afterward for an inclusive and interactive discussion of the film, melting ice and sea-level rise, and climate change issues in general. Tall Tale, or the Height of Innovation? The basic principle of a downdraft energy tower. Solar Wind Energy, Inc., a clean energy developer, has proposed an ambitious project: the construction of two gargantuan "downdraft towers" in Arizona near the Mexican border. The skyscraper-sized cylinders (at 2,250 ft in height, they would stand below only the Burj Khalifa in Dubai) would -- as with a windmill -- generate electricity through the force of spinning turbines. Instead of wind, however, the rapid movement of air is a product of the pressure differential between the top and bottom of the structure. Read more about the project at Forbes; see Wikipedia for more on the technology itself.